We gladly offer the sign and seal of God’s grace in the waters of baptism, both to children whose parents are on the journey of Christian faith and discipleship and to adults of any age who are coming to that journey themselves for the first time. The Sacrament of Holy Baptism is the sign and seal of God’s grace and covenant in Christ. Baptism is an outward and visible sign of the grace of God. Through baptism a person is joined with the universal church, the body of Christ. In baptism, God works in us the power of forgiveness, the renewal of the Spirit, and the knowledge of the call to be God’s people always. Baptism signifies the faithfulness of God, the washing away of sin, a rebirth, putting on the fresh garment of Christ, and adoption into the covenant family of the church. 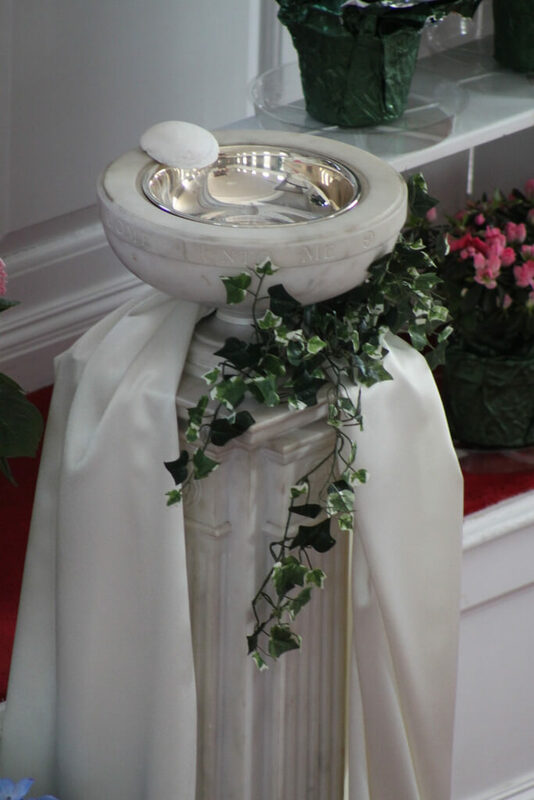 Water is an essential element of baptism. Water is a prominent symbol of cleansing and life in the Bible—the water of creation, the great flood, the liberation of Israel through the sea, the water of Mary’s womb, the baptism of Jesus in the Jordan River, the woman at the well, and Jesus’ washing of the feet of the disciples. In our tradition, we put particular emphasis on the sacrament of baptism as being the sign and seal of our incorporation into a covenant community, the gathering of a whole community of people who together are the body of Christ in the world and seek together to be faithful disciples. Because of the importance of the gathered community to what baptism means for us, we always celebrate the sacrament within the regular Sunday worship services of our congregation. In our tradition, we baptize adults who are coming to Christian faith and community for the first time, and we also baptize children whose parents are part of the Christian community. The baptism of children witnesses to the truth that God’s love claims people before they are able to respond in faith. The congregation, on behalf of the whole church, assumes responsibility for nurturing the baptized children in the Christian life, and the congregation explicitly makes such a promise during the service. For more information on baptism, what it means to us, and how one can arrange to celebrate a baptism, please be in touch with either of our pastors.